30 Reasons to Stay 4 nights! I always say beware the smaller mountains in Acadia because they tend to be the steepest. Acadia Mountain is no different. In fact, where Acadia Mtn. is located there are two of the smaller-yet-steeper mountains on the island, with St. Sauveur being the other. And yet these smaller mountains often offer intimate views that the larger mountains don’t. The four mountains in this area just north of Southwest Harbor are no different. Acadia Mountain is probably the most popular of the four mountains: Acadia, St. Sauveur, Valley Peak, and Flying Mtn. are all nestled together in the Valley Cove area. Parking is in two places. The spot off Clark Point Rd. doesn’t have much space, but is best if you’re tackling Flying Mountain and Valley Peak. The more popular parking area is the Acadia Mountain lot just off Rt. 102 near Echo Lake. From the lot, cross the street, and you’ll find your first decision. It doesn’t matter if you go left or straight, as both will take you to the Acadia Mountain trailhead. Going left is a bit faster, but straight is better for St. Sauver Mtn. Now, I normally recommend going up the steeper hike and coming down the less-steep trail, but with Acadia that’s different because the steeper trail on the back side of the mountain has better views that are right in front of you as you hike down. So having said that, go up the trail that’s closest to the road. 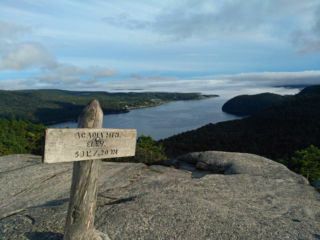 At the top, enjoy the magnificent views of Somes Sound and Valley Cove. Head down the other side, keeping those views in front of you, until you get to the Man-O-War Truck Road. Follow that to the right will bring you back to the parking lot. Acadia Mountain itself, up and down, is about 1.5 – 2 hours long. However, if you’re looking for a good, full day of hiking then tackling more than one peak will definitely get your exercise in. Adding St. Sauveur will add another two hours to Acadia, and then adding Valley Peak and Flying Mtn. will add another 2-3 hours on top of that. In total, doing all four peaks, car-to-car, it’s about 6-8 hours and a lot of hiking up and down. The good thing here is that there are loops and one can keep going or call it quits and head back to the car without too much trouble. And after a long, hot day of hiking, head back to the car and walk down the Echo Lake Bluffs trail to grab some excellent swimming. For more info on how to do this, check our availability calendar and we’ll be happy to give your our local advice: www.miramonte.com. Lobster boat races are a part of the tradition of lobstering along the coast of Maine, and have been since the introduction of powered boats in the early 1900s. There are professional lobster racing boat builders, and then there are the amateur, real-life working lobstermen and women who take the day off to have some fun and show what their boats can do. Several communities have their race day, and there’s even a points series for the winners. But it’s mostly all fun. Some do it for the trophy, but the vast majority of them do it for the bragging rights. Of course, no lobster boat race day is without a blueberry pancake breakfast. Mount Desert Island’s lobster boat races take place in Bass Harbor, about a 20-min drive from Bar Harbor, and this year the fun is on Sunday, June 24th. Breakfast starts at 7am and goes until 10am, with lunch from 11:30 until the races end, usually around 1pm. Food is served on the Bernard Town Dock. Having been to many over the years, we can attest that it’s a wicked good time. To book your stay, check out our availability at: www.miramonte.com.